Released at the end of 2007, The Golden Compass aimed to become the third jewel in a crown of mega-grossing 21st century fantasy adaptations, following The Lord of the Rings and The Lion, The Witch And The Wardrobe. The first film in an intended three-film cycle based on Philip Pullman's His Dark Materials trilogy, Chris Weitz's The Golden Compass instead became caught between worlds -- not an inappropriate fate for a story about interdimensional travel -- and was quietly buried. In one regard, this was a vestige of poor timing. When it arrived, The Golden Compass was released into a Hollywood whose box office interest (and more importantly, shareholder outlook) was based on how films performed domestically. The Golden Compass' shoddy $70 million box office take in the United States, against a $180 million budget, marked it as a resounding dud. The film did remarkably better overseas, though, a benchmark which would become the primary focus of the industry just a couple of years later. The Golden Compass' global take was $372 million; for context, J.J. Abrams' Star Trek would pull down about the same figure two years later ($385 million), and be deemed a franchise-launching hit, because more of that money came from American wallets. Nowadays, Transformers movies barely have to open in the States to rake in overseas money that keeps that franchise indefinitely afloat. I remark upon this largely to point out that in any number of ways, The Golden Compass was ill-conceived as an American studio project. His Dark Materials has its fans, but a lot more of them are in Europe than the U.S. (The novel's reformulated European geography is a big part of its charm, actually.) As much as The Lord of the Rings was an extraordinary gamble when New Line financed it in 1999, it was a risk mitigated by a baseline level of familiarity with Tolkien's novel amongst American audiences; giving the project to a crazy pack of Kiwis to make quietly on the other side of the world, at relatively lower cost, brought the risk down even further. Much like Jackson's subsequent Hobbit trilogy, though, The Golden Compass would never have had the luxury of The Lord of the Rings' anonymity -- in fact, nothing coming after The Lord of the Rings, and aiming to make itself "the next Lord of the Rings," ever could have. New Line Cinema -- hungry for another LOTR-sized hit to keep itself financially independent -- staked its solvency on lightning striking twice. Does lightning ever strike twice? The company would be folded back into its parent, Warner Brothers, shortly after The Golden Compass bombed. Enough about the money, except to say that the financial pressures upon New Line to re-create the success of The Lord of the Rings also created a film whose studio-overthinking is so apparent in every narrative and creative decision that the result is scarcely watchable. The Golden Compass is an awful, awful, awful movie. It just happens to be based on my favourite book of all time. Pullman's novel is as deft and skillful as Weitz's screenplay is plodding and unimaginative. A simple, delicately-layered quest narrative of a young girl named Lyra traveling north to find her father in an alternate version of Earth, The Golden Compass and His Dark Materials beyond it serve as a corrective for the fantasy novels of the 20th century, particularly C.S. Lewis' The Chronicles of Narnia. Lyra is no saintly Christian schoolgirl; she's a rough-and-tumble beast of a thing, whose skill at lying earns her the name Silvertongue, and whose experience of puberty directly informs her journey going forward. Though not strictly atheist (Pullman's cosmology does, canonically, include a God character, and a hint at another omnipotent creator preceding even God), the storyline takes cues from Milton to wonder what, exactly, the Almighty as described in the Christian bible would be like: a tyrant? A king? A senile old man? Lyra's parents, played in the film by Nicole Kidman and Daniel Craig, are undertaking to unravel the origin myth of the human race itself: if the Garden of Eden's forbidden fruit was knowledge and self-determination, then what does its forbidden nature say about God? The film, naturally, backs away from all of this as only an American production can. Puberty is off the table (in fact, it's a surprise that the studio didn't cast Lyra as a post-pubescent, and more easily sexualizable, teenager), and as for any war against God, well, forget about it. The Lion, The Witch and the Wardrobe succeeded, in part, by snagging the coattails of the gargantuan faith-group support of The Passion of the Christ; if New Line had positioned The Golden Compass as the atheist/agnostic counterpoint to that success, who knows what would have happened, but the studio chose instead to remove anything that could marginally be termed offensive to the Christian right, to hedge every conceivable bet. These decisions gut the picture. The gutting extends beyond just the religious allegory in the source novel. Every single aspect of Lyra's journey is dumbed down through leaden exposition, in an unsuccessful attempt to over-explain the rules of the world we're in. 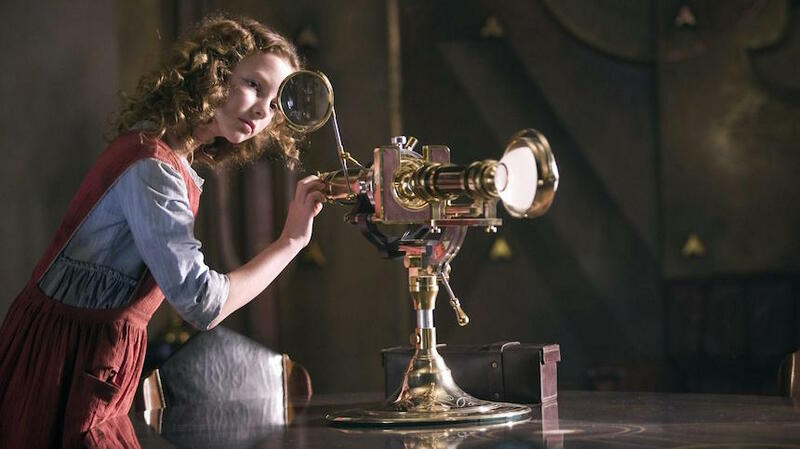 Lyra, played by Dakota Blue Richards (it was the 2000s, and blonde girls named Dakota were popular), doesn't so much "quest" as ask a bunch of questions of every adult she encounters, so that they can explain what golden compasses, Panserbjorne, and daemons are. It's needless, a fundamental betrayal of cinema's original rule (show, don't tell). We are in a Mirror Universe version of the world we know: simply showing the differences would have communicated more than any dialogue ever could. Weitz's script moves through The Golden Compass' basic plot points like a parent running the shopping list, but Weitz himself (About A Boy was his primary claim to fame at this point; he more recently co-wrote Rogue One) isn't much of a filmmaker. Opportunities to elevate the material with blocking or design are left on the table. His more seasoned cast-members, Nicole Kidman and Sam Elliott among them, bring layers to their characters by simple dint of craft; those more in need of Weitz's direction (young Richards, and a completely-out-of-his-element Daniel Craig) can't figure out who they're supposed to be playing in this world of archetypes, populated by talking bears and portentous Northern Lights. All of this can merely be filed as "disappointments" until the film's ending, which remains an astonishingly ill-thought choice even today, ten years later. Pullman's book ends on a sublime note of maturation for Lyra, whose quest to find her father leaves her blind to its cost until a horrible sacrifice has been made; having learned her lesson, she departs this world into the next novel's adventure as the sky itself literally opens up the possibilities of where she could be going. The film treats with none of this, choosing instead to end the story shortly after the novel's second act, saving any blood and sacrifice for a potential later film in the series so as to -- what? Not risk giving an audience a complete dramatic experience? Like Barry Levinson's adaptation of The Natural, this change to the ending of The Golden Compass doesn't just weaken the story; arguably, it outright reverses its meaning. The Golden Compass, the book, uses layers of story to invoke the idea that it is our growth into self-awareness that makes us most uniquely human, and that this is what God sought to take away from us in Paradise. The Golden Compass, the movie, suspends its narrative with its child protagonist safely unaware of her forthcoming change, cuddled in a crib with her childhood best friend, watched over by a friendly bear and a coven of witches. It's the cinematic equivalent of helicopter parenting: don't grow up, don't ever even worry about growing up. We, like benevolent God, can protect you forever, so long as you remain a child. It's nauseating pablum, an entitled abdication of responsibility for both the self and the world, and it betrays everything Pullman wrote about. In this way the film is, in a sense, quintessentially Hollywoodian -- a filmmaking output which Mark Cousins calls "the bauble," reassuring wish fulfillment at the highest level of artfulness. The Golden Compass wasn't even a particularly good bauble. Finally, a decade later, it's time for a series of fresh chances. The BBC is working on an adaptation of His Dark Materials for television now; and more excitingly, Philip Pullman will publish the first in his series of sequels to the trilogy, The Book of Dust, this week. If you haven't read His Dark Materials, I highly recommend it; if you haven't seen The Golden Compass, count yourself better off.